Italian showjumping star Piero d’Inzeo has died at the age of 90, only three months after the passing of his famous younger brother Raimondo. Piero d’Inzeo died in Rome on Thursday, February 13. He would have turned 91 on March 4. Raimondo d’Inzeo died on November 15 at the age of 88. The brothers were both military officers – Piero was a colonel with the Italian army and Raimondo was a major in the Carabinieri – and they were the first athletes to compete in eight Olympic games, consistently from 1948-1976. In their day, they were the heroes of equestrian sport in Italy and were renowned around the world. Piero won a total of six Olympic medals. 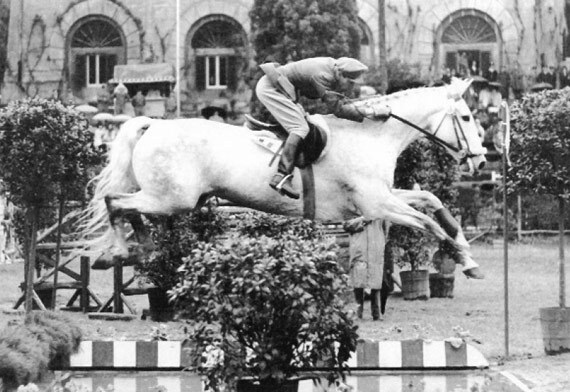 Raimondo won showjumping gold at the 1960 Olympic Games in Rome, with Piero winning silver on Uruguay. Piero also won team silver and individual bronze in 1956 on Uruguay, and bronze team medals in 1960 (The Rock), 1964 (Sun Beam), and 1972 (Easter Light). In 1964 and 1972 the brothers shared the glory of team gold. Piero d’Inzeo also won medals at four consecutive FEI European Championships. He took the individual title in 1959 at the Parc des Princes in Paris (FRA), individual silver at Aachen (GER) in 1958 and 1961, and shared silver with the legendary Hans Günther Winkler at London (GBR) in 1962, the same year that d’Inzeo won the prestigious Dublin Grand Prix in Ireland. Piero d’Inzeo at left, with his brother Raimondo, and at front, Antonio Gutierrez, in Pizza di Siena, Rome, Italy in 1960s. Showing his versatility in the saddle, Piero d’Inzeo finished sixth in the three-day-event at the 1952 Olympic Games in Helsinki, riding Pagoro. Piero d’Inzeo remains the rider with the most wins in the CSIO Piazza di Siena, and won a total of 64 competitions, and seven grand prix. D’Inzeo won the Grand Prix of Aachen four times between 1952 and 1965. He visited the CHIO Aachen the last time in 2011, when Italy was the partner country of the event. During that visit to the city he was moved to tears on the balcony of the Town Hall by the warm reception of Aachen locals. Following the reception, d’Inzeo took part in the CHIO Opening Ceremony together with Carl Meulenbergh, the President of the Aachen-Laurensberger Rennverein and the German show-jumping legend, Hans Günter Winkler. On Piero’s 90th birthday last March, the Italian Defence General Staff awarded a joint medal of honour to Piero and Raimondo. Together they represented a golden age of Jumping and created an incredible equestrian and Olympic legacy for Italy. Gianfranco Rava, Special Commissioner of the Italian Federation of Equestrian Sports, said it was a sad day for the sport. “What struck me is that Piero has died less than three months after his brother Raimondo, as if to underline the proverbial understanding that has always linked the ‘Brothers of Italy’ in the field and in life,” he said. Piero d’Inzeo’s funeral will be held on Monday, February 17 at 11 am at the Hippodrome Military January Pietro Giannattasio (Viale Tor di Quinto No. 118 – Roma). His body is to lay in state at the Italian National Olympic Committee (CONI) Hall of Honor over the weekend.